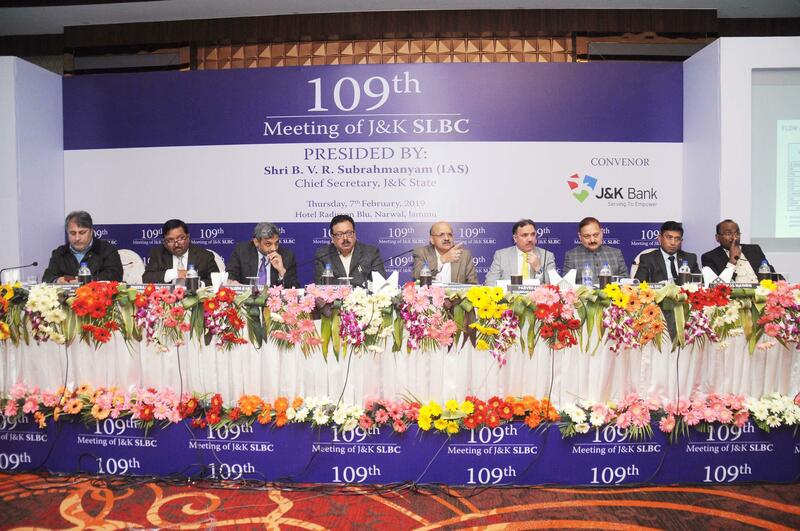 J&K Bank convened 109th meeting of J&K State Level Bankers’ Committee (SLBC) todayat Jammu which was presided over by the Chief Secretary J&K Government Shri B V R Subrahmanyam and also attended by Principal Secretary, Housing & Urban Development, Dheeraj Gupta, Financial Commissioner Revenue Dr. Pawan Kotwal, Principal Secretary Finance, Navin Kumar Chaudhary ,Principal Secretary Industries & Commerce, Shaleen Kabra ,Principal Secretary Animal Husbandry Dr. Asgar Hassan Samoon ,Regional Director, RBI Thomas Mathew, Chief General Manager, NABARD P. Balachandran, Divisional Commissioner, Jammu Sanjeev Verma, Deputy Commissioners of Jammu, Reasi, Samba & Udhampur and other senior functionaries of the State Government, banks, NABARD, Insurance Companies & BSNL. The Deputy Commissioners of Bandipora, Ganderbal, Kupwara & Pulwama joined the meeting through Video Conference. Expressing concern over poor lending in the agriculture, MSME and housing sectors in some districts, the Chief Secretary B V R Subrahmanyam said “The Government is committed to uplift the economic profile of farmers and artisans with improved flow of credit and the numbers presented in the Priority Sector especially Agriculture, MSME and Housing Loan segments are not in sync with the stated objective. We need to introspect, track down the obstacles and find out the reasons for putting up a dismal show. Banks should push up their efforts aggressively and work in coordination with District administration for realization of goals.”He directed the convenor bank to undertake a micro analysis at the district level to understand the problems and bottlenecks in the flow of credit and take corrective action .He also underscored the urgency to improve the penetration of the formal lending to micro and small enterprises by mapping the constituents especially in Jammu and Srinagar where the offtake under the segment was very poor with a drag on the achievement of CD ratio/priority sector targets. “Other priority sectors like Handloom, Dairy and handicraft need to be addressed in a focused manner as J&K has a huge potential for development in these sectors. All stakeholders have to work in tandem to aggressively monitor and sensitise the operative levels in the bank branches to put in serious efforts for a quantum improvement in the flow of credit to the productive sectors of the economy. ” He added. Speaking on the role played by banks in social development he said that private banks need to participate actively in the government programmes and schemes. Banks also need to gear up to achieve the targets of business expansion and opening of branches. He directed the state Bank of India to immediately start the construction of the proposed RSETI at Kargil. He also observed that Poultry insurance is not being done and advised the representatives of the insurance companies to undertake insurance henceforth to give the much needed protection and fillip to the poultry sector as the state was heavily dependent upon imports to the tune of Rs 2500 Cr from the neighboring states . Delineating the details of the Prime Minister Kissan Samman Nidhi Yojana the Chief Secretary urged upon the bankers to work in mission mode to cover all the beneficiary farmers under the scheme by opening of the accounts as the amount under the scheme of central government to provide income protection to the distressed farm sector has to be routed through Bank accounts and in no case the amount will be handed physically. All the data regarding the scheme along with aadhar card and other vital information needs to be uploaded to the portal as soon as the instructions for the same are received from the central government. The banks he added have performed well in the Prime Minister Jan Dhan Scheme and they will accomplish this task too with equal zeal and passion. Commenting on the performance of the new generation private sector banks Principal secretary Finance Navin Choudhary advised the banks to focus not only on the mobilization of low cost deposits from the state but also participate in the priority sector lending and expansion of branches in the rural areas. Earlier J&K Bank Chairman and CEO (Convener J&K SLBC) Parvez Ahmed in his welcome address expressed gratitude to the Chief Secretary for his consent to preside over this meeting to guide the house with his enlightened thoughts and erudite comments. He apprised the house that the as per the directions of the Chief Secretary in the 108th SLBC, the data has been captured from the SLBC portal which has been made available to all the stakeholders to access and upload their data online. Besides to promote decision making and facilitate comprehensive deliberations, the SLBC as per the directives of the Chief Secretary will be running a Power Point Presentation to direct the focus of the house on the major issues associated with the Agenda which has already been circulated. Subsequently the President J&K Bank Sunil Gupta made a brief presentation about the functioning of the banks and apprised the forum that the banks operating in J&K have extended a total credit of Rs.21,821.98 Cr in favour of 6,20,993 beneficiaries registering an achievement of 68.84 pc in financial terms and 58.11 pc in physical terms during the first three quarters of the Current Financial Year against the annual target of Rs.31,697.61 Cr for 10,68,686 beneficiaries under Annual Credit Plan 2018-19 out of which Jammu and Kashmir Bank alone has disbursed Rs.14,740.81 Cr during the period under review, which makes for 67.55 pc of the total credit extended by the 43 banks and financial institutions operating in the State. During the meeting House also constituted a sub-committee to analyze, approve and roll out Annual Credit Plan for FY 2019-20 for J&K State.